There are several things that you- a guitarist- can do to give your tones a superb push from the rest. The most obvious is to better your level of techniques. You may also consider replacing your guitar with a high-end model and also try to up your game regarding musical hardware and technology. Now, you can’t think about advanced guitar hardware without a reverb pedal showing up. But before grabbing the first pedal that comes your way, do understand that there are over 16 varieties of guitar pedals including this one. To help you make an informed decision, we have scoured the market and identified the leading reverb pedals brands. Our selected products are a mix of price, brand and type. To make sure we've something for everyone for beginners, pros, for acoustic guitar or a budget friendly one that will cost you around $100, we have something for you. We also have a comprehensive buying guide detailing the factors you should consider when buying one. Our recommendation for beginner and professional reverb pedal is TC Electronic Hall Of Fame for several reasons, its the most used reverb pedal, TonePrint, true bypass. In short its a collection of the ultimate pedals put together in a single piece. 9. Rowin Ocean (Digital)- Budget Friendly option. If you’ve just bought your guitar and want to experience some really good sound without spending much, this one is yours. For those strapped for cash, you’ll be amazed to find out Ex costs way below 30 dollars. It’s also shipped to you free of charge (well, as at now!) thereby making it more affordable. Despite being amongst the cheap reverb pedals on the market today, Ex combines versatility and convenience to bring a stompbox you’ll never play your guitar without. It offers you a variety of sound effects modes including echo, space, plate, spring, room, and hall. It also has 4 functional knobs that let you alter the volume, reverberation time, and also switch from one mode to the other. Even better, you get a pedal that offers either dry or wet tones at the kick of a knob. When purchasing a reverb pedal, there are 3 things that you’ll certainly consider: convenience, functionality, and durability. Fortunately, Rowin packs these and other great perks in their Ocean digital reverb pedal. To start with, this reverb is hands down one of the cutest we came across. It has a presentable aluminum-alloy chassis and nicely aligned controls. It offers Room, Shimmer, and Spring reverb modes which can be altered via a toggle switch positioned between the Tone and Mix knobs. Better enough, you can choose to go all-natural by zeroing all the effects by hitting the True bypass switch. Are you looking for a reverb pedal that lets you rock without much tweaking? Enter the Void. This tank is for those who don’t want to spend much time hitting switches and control buttons. It’s quite unbeatable for its price and killer performances. The Void has a small and compact design. It ships in a strong foam-padded storage box that keeps the pedal safe when on transit. The pedal itself is easy to use with only 2 control buttons; Mix and Decay. Cranking these 2 up gives you some nice warm analog tone that sits perfectly in your mixes. It also has the most revered True Bypass switch that lets you get natural, uncolored tones when need be. Another unit that wouldn’t miss a slot IS this unit by Donner. One thing that attracted us to this pedal is its compact design and the versatility it tucks therein. At 3.9’’ x 2.4’’ x 2.4’’, Donner will easily fit on any pedalboard and also allow you to stack other pedals such as delay. Another reason why we recommend this pedal is that it has intuitive controls, well labeled, and easy even for the starters to use. Donner has 7 reverberation modes that you can choose to color your mixes with. All the modes sound great. You’ll certainly get several to fit your style. It also has a LED that lights up to show when its working. Electro-Harmonix has been designing some of the most recommended reverb pedals for several decades now. Their Holy Grail series of guitar effects pedals is respected for its top-notch professional units. Neo Digital Reverb pedal is their latest addition, and it’s already headed for the top. Unlike Donner above, Electro-Harmonix Neo offers you only 3 reverberation modes; Hall, Spring, and Plates. As few as they may be, this is the unit you want to turn to if you want real reverbs in your tones. The 3 algorithms are professionally tailored for electric guitars. However, you can also use it to color other instruments and voices too. It also has a reverb knob that lets you switch from pure dry to 100% wet tones or anything else in between. In most instances, you’ll have to try out several units before getting the best for your guitar and other uses. But this mostly happens with 20-dollar units that can be easily replaced without a second thought. If you don’t want to go through this hectic process though, a professional unit like Boss RV-6 is all that you need. You’ll certainly get attached to this pedal from the word go. It’s a small but effective box that delivers superb sounds from your electric guitar. Amazingly, there are only a couple of controls to tweak before you get the complete reverberations you’ve always wanted. Boss RV-6 packs 8 sound modes each with a unique algorithm. You can choose from a pool of old-school vintage effects to crisp modern-day textures. Not only this, but Boss RV-6 reverb pedal also supports both mono and stereo operations. MXR M300 is purposely for guitarists who want to keep their pedalboards simple but without compromising the amount of ambiance they get from the effects. At close to 200 bucks, the M300 is several folds pricier than most reverb pedals here. However, if you can purchase it, you’ll be glad you splurged on it thanks to its great sounds and quiet performance. To begin with, MXR M300 has a simple 3-knob setup for easy navigation. It has a visible blue LED that lights up to show when the pedal is active. Again, it offers 6 high-end reverb styles each accompanied by a dedicated LED to show the selected reverb effect. Just like you’d expect from a high-end reverb model, each of M300’s effects is detailed and clean. You can choose to go either 100% Dry or engage the 100% wet mode. It also has true relay and trails bypass. What are you looking for, the best spring reverb pedal on the market today? Electro-Harmonix Holy Grail Nano is certainly what you have in mind. Holy Grail Nano delivers unmatchable spring reverbs meticulously crafted for the hard-to-please guitarists. You’ll be blown away by what this little metallic box can do. Spring isn’t the only reverb effect you get though. It also has pretty detailed Hall and Flerb. This reverb pedal also has the most sought after wet/dry control knob. It lets you choose the amount of subtle reverb to be added to your outputs. Without forgetting, Holy Grail Nano also comes with a dedicated 96DC-200BI power supply. As such, you can take the unit for a drive immediately after arrival. It’s fair to call Behringer’s RV600 a great deal reverb pedal for serious musicians on budget. This reverb machine packs tones of cheesy features that you won’t find on any other reverb pedal out there. Sure, it might not beat the pricey Bos RV-6 and Holy Grail Neo in terms of performance. However, it’s of decent quality and offers greater flexibility with different types of styles. Behringer RV600 tends to have a rather too busy face. But that’s because of its tons of modes ranging from classic spring reverbs to some of the best-in-class modern tones. It also uses Behringer’s Real Sound Modeling Technology that brings uses DSP technology and some sophisticated algorithms to create some real acoustic environments. Among other things, Behringer RV600 boasts a battery compartment with a dedicated battery check LED. It also has dedicated controls for Decay, Mix, type, time, trails, and tones all which you can tweak to get the shape of sound you want. It’s very likely that you’ve heard of this one. It’s currently the Lamborghini in the world of reverb pedals. Hall of Fame is a professionally designed stompbox that is creating a good buzz around due to its gold-standard performance and extreme versatility. One feature that makes it stand out is its TonePrint feature. This is a million-dollar feature that lets you download additional sounds from the internet into your pedal or Computer. This means that you are not limited to the sounds available in the pedal alone. Besides Toneprint, TC Electronic Hall of Fame reverb pedal offers you 10 different reverb types. That said, thou shall never get bored with the same sounds again. This pedal has also be designed to last, and it’s amazingly easy to use. In fact, you won’t need the manual for that. 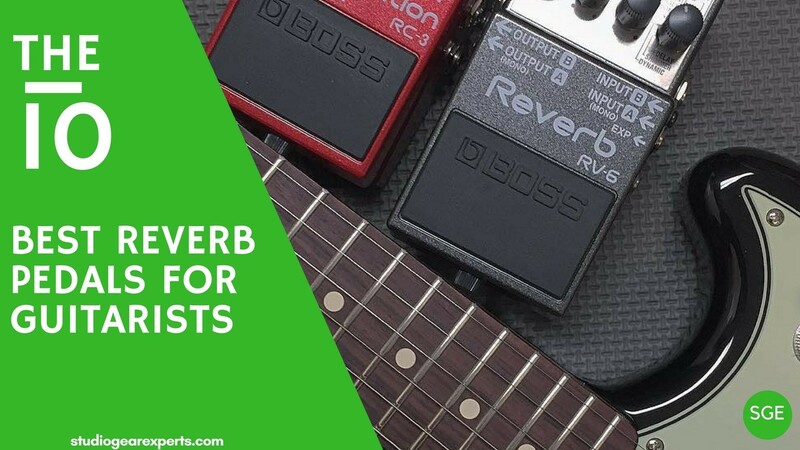 A reverb pedal is a quintessential element for your guitar sounds. Its name is derived from reverberation- making a sound appear vibrant and to last longer. Essentially, reverb pedals create an echo. They do this by giving your sounds some sense of space. The atmospheric depth given to your sounds varies from an impressively slight echo to extreme shaky and swinging sounds. Sure, most guitars come with built-in reverb effects. On the flip side, these reverbs don’t bring out the reverberations you would expect. No wonder most professional guitarists consider their signal line incomplete without a standalone reverb pedal. When shopping for a reverb pedal, you’ll have to choose between analog and digital pedals. While this often boils down to one’s preference, most people favor analog models. Analog units are considered to have more pleasant and natural tones. That doesn’t mean that Digital reverb pedals are any weaker though. These units have had a tremendous improvement over the last decade. They are becoming better each year. Spring- A spring reverb pedal is a humanmade unit that employs transducers that produce effects from sounds received by springs. They have incredible frequency characteristics, for instance, resonance in the body. They are, therefore great reverb pedals for electric guitars and vocals. Plate- similar to Spring reverbs, Plate pedals are analog devices that use a sheet of metal or plate. This sheet vibrates upon being struck by the sound waves from the guitar. Hall, Chamber, and Room pedals wok by imitating the original sound in a physical space. The difference between these 3 is on how long their sounds last in the air. Hall pedals produce sounds that last anywhere between 1.2 to 3 seconds. Chamber pedals make sounds that hang around for .4 to 1.2 seconds. Room pedals have echoes with the shortest timeframe. It lasts for .2 to 1 second. Lastly, you’ll require a pedal with features that let you create fuller and richer sounds that are appealing to your fans. It’s also recommendable to go for a reverb pedal that lets you blend several sounds. By the same vein, consider the number of effects offered by the pedal. Some of these reverb pedals in our list of 2017 have up to 10 effects. Whether you’re playing live or just for fun, fitting one of the best springs reverb pedals in your signal line helps in spicing up your guitar sounds. The best reverb does more than enhancing your performance; it introduces you to a whole lot of unbelievable sounds you may never have heard of. Have you had an experience with any of the reverb pedals we’ve reviewed above? Or do you have a question about these units? Let’s meet in the comments section below.